At the westernmost reach of the Preserve is a lovely, ecologically diverse parcel of shoreline woods. The story of how, in 1984, this 3.4-acre tract came to be part of the Preserve is an inspiring piece of local environmental history. It is the story of how committed citizens can act to protect a small but important piece of our natural heritage. Were it not for the dedication of many conservation-minded people—students, faculty, university administrators, elected officials, newspaper editors, and Madison residents—this little ecological gem would have become just another shoreline building site. Instead, we can all enjoy a continuous stretch of undeveloped Lake Mendota shoreline stretching from the Village of Shorewood Hills all the way around Picnic Point to Willow Creek. Lake Mendota and the broader Four Lakes region of southern Wisconsin provided homes for Native Americans for thousands of years prior to European-American settlement in the mid-1800s. The native peoples of this region left behind abundant evidence of their lives here. The nearby Indian burial mounds, at the top of the Eagle Heights Woods bluff just to the south, are but one of the many examples of how these early residents left their imprint on the land. Modern archaeological investigations have not been conducted in Wally Bauman Woods because of the site’s steep slopes, which would have been an unlikely location for settlements. University ownership of Wally Bauman Woods is a complicated story of land deals and citizen action. The university first acquired the parcel in 1911 from George Raymer, a prominent Madisonian and newspaperman who published the Madison Democrat, in a real estate transaction that included his large farm. (Raymer’s property included all of the area that today includes Eagle Heights Apartments, Eagle Heights Woods, Big Woods, Tent Colony Woods, and Wally Bauman Woods.) The state legislature took great exception to the purchase price negotiated by the university of $1100 per acre—about seven times more than the assessed value at the time! A special legislative committee directed university President Charles Van Hise to resell the property for the value paid. Not surprisingly, this price was prohibitively expensive—even for the most ambitious real estate speculators—and in the end, the university retained ownership. Seen from the perspective of the twenty-first century, this 1911 land acquisition now appears in a more favorable light. It added much-needed agricultural research land to the campus, and protected the northwestern flank of the growing university. But surprisingly, before this land was to receive permanent protection as a natural area, it first became private property again as part of an unusual trade. In 1939, the university purchased an option to acquire the Picnic Point Farm from Edward Young. The Young property included the much-loved Picnic Point—long a popular recreational destination for students and Madisonians alike. It was hoped that additional funds could be raised to finalize the land acquisition with Young, but two years passed and the negotiations appeared to be going nowhere. Then, in 1941 a new deal was struck, whereby the university agreed to pay Young cash and convey to him the title for Eagle Heights—from the top of the bluff all the way down to the lake. In a single deal, the campus gained Picnic Point and lost Eagle Heights. Ten years later in 1951, following Edward Young’s death, the 28-acre Eagle Heights uplands (today’s Eagle Heights Woods) were acquired by the Brittingham Trust, which proceeded to donate the property back to the university. The Young estate continued to hold the lower portion of the Eagle Heights tract (north of Lake Mendota Drive) until 1959, when this last piece of the property was sold to a land developer. The developer proceeded to build the multi-story Cove Condominiums and then sold the remainder of his property to another developer. The so-called Lower Eagle Heights Woods remained undeveloped until the early 1980s, when its owner decided to build several duplex condominiums there. 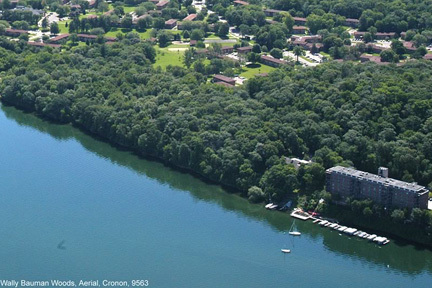 Opposition to the proposal produced an immediate public outcry—demanding that one of the last remaining privately held parcels of wild shoreline on Lake Mendota be saved from residential development! Other activists wrote impassioned letters to the editor, while other preservationists attended public hearings convened by the City Park Commission, the Plan Commission, and the City Commission on the Environment. The two local newspapers, the Wisconsin State Journal and the Capital Times, both took editorial stands in favor of creating a public land conservancy for this shoreline tract. While there was a growing consensus among city officials and concerned citizens that the woods should be saved, there was one daunting obstacle thwarting purchase—this little 3.4 acre strip of land was now assessed at $425,900. Raising this money was thought by some to be nearly impossible. Time was running out as the developer pushed forward with applications for a construction permit. It soon became clear that no single funding source could meet the sale price demanded by the developer. In response to this seeming impasse, a new approach to land conservation arose that would have far-reaching consequences—not just for the Lakeshore Nature Preserve but for other natural areas in Dane County. With the support of the mayor’s office, a new private non-profit organization was formed: the Dane County Natural Heritage Foundation. This new group would act on behalf of the public and private groups as an agent for land acquisitions. And so it was that the very first land deal coordinated by the Dane County Natural Heritage Foundation (renamed the Natural Heritage Land Trust then later Groundswell Conservancy) brought together public funds from the university, the city, the county, and federal matching grants administered by the state. In addition, private donations were gathered from environmental groups and a “Save the Woods” fundraising campaign promoted by the Wisconsin State Journal. In early 1984, after many years of hard work by citizens and public officials, the deed to the shoreline parcel know as “Lower Eagle Heights Woods” was acquired by the conservancy. Groundswell Conservancy subsequently transferred the property to the City of Madison, which in turn passed the property to the university. This complex series of transactions permitted the City of Madison, Dane County, and Groundswell Conservancy to retain development rights for the property. The resulting land-use restriction, or conservation easement, means that while the university owns the land, building large structures on the site is expressly forbidden, though small site amenities such as benches, stairs or signs are allowed. Interestingly, the university also granted a conservation easement on the 8-acre parcel of shoreline immediately east of Wally Bauman Woods—which it already owned—as part of the overall transaction. This 8-acre parcel is now part of Tent Colony Woods west of Raymer’s Cove. On October 26, 1984, the city formally transferred the “Lower Eagle Heights Woods” property to the university. At this time the name of the parcel was changed to honor Walter R. “Wally” Bauman, a Dane County Supervisor and former mayor of Middleton. Bauman had played a key role, working with other conservationists and elected officials, in making the purchase possible. Sadly, Wally Bauman died before the land transfer was completed, yet his work, and that of many others, lives on in the parcel of land that is now forever protected as the westernmost shoreline corner of the Lakeshore Nature Preserve. 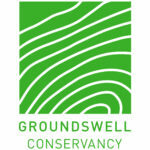 Groundswell Conservancy has continued its important work preserving land. Since their inception in 1983 they have protected thousands of acres of land in the Dane County region–all of which arguably got their start in the struggle to protect Wally Bauman Woods. Linda Thomson and Mike Stamler, “DNR Enters Fray over Eagle Heights,” The Capital Times, Aug. 17, 1983, pgs. 19 and 20. See Thomas D. Brock, “Eagle Heights,” Historic Madison: A Journal of the Four Lakes Region 12 (1995), 37-44. Tour of Wally Bauman Woods. Photo by Jim Welsh. One of the motivations for preserving Wally Bauman Woods was its relatively intact ecological communities of plants and wildlife. By the early 1980s, most of the privately held Lake Mendota shoreline was rimmed by residential or institutional developments. Here was a small forested area that had the potential to extend important plant habitats and wildlife corridors linked to the much larger and nearly contiguous Eagle Heights Woods to the south. Prior to acquisition, Jim Zimmerman counted 84 species of plants just in this small patch of woods. Wildlife ecologist Joe Hickey was able to observe 29 breeding pairs of birds here. 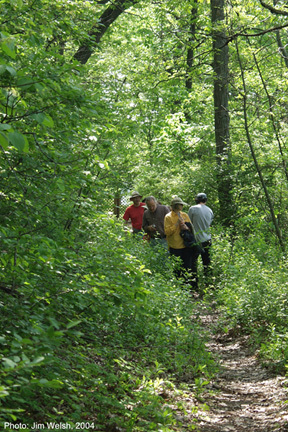 Today Wally Bauman Woods retains many of the plants and animals noted by Zimmerman and Hickey. Like so many natural areas across the state, however, Wally Bauman Woods has its share of invasive species that are competing with native plants—and thus affecting the food and habitat available to wildlife. The Preserve is dedicated to managing all of the lands under its care so that the ecological attributes so many people fought so hard to protect will be available for future generations to observe and enjoy. The 2006 Lakeshore Nature Preserve Master Plan envisions a variety of cultural and ecological enhancements that will improve visitor experiences and protect resources. The Plan calls for continuing to manage this area as a mesic woodland, consistent with the vegetation type that extends eastward through Tent Colony Woods to Frautschi Point. As with other areas in the Preserve, invasives removal, erosion control, and maintenance of shoreline view openings will be part of the mix of management activities in Wally Bauman Woods. Due in part to its location away from the well-populated areas of campus, Wally Bauman Woods receives relatively few visitors. This makes it an ideal destination for the hiker seeking to get away from campus crowds. Abundant birdlife and a diverse plant community can easily be enjoyed from the Lakeshore Path. A trailhead to Wally Bauman Woods is located on the north side of Lake Mendota Drive directly across from the Eagle Heights Drive intersection. If using this trailhead, please note that the trail descends a fairly steep grade. Search for “Wally” in the Interactive Map to see this location. 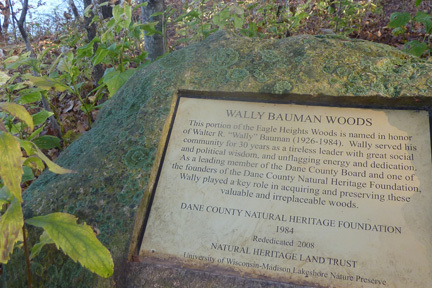 The Wally Bauman Woods trailhead is located on the north side of Lake Mendota Drive directly across from the intersection of Eagle Heights Drive (the east-west road that cuts through the Eagle Heights Apartments complex). Campus bus #80 makes regular stops across from the Lake Mendota Drive trailhead to Wally Bauman Woods. Wally Bauman Woods can be reached by taking Lake Mendota Drive to the trailhead across from the Eagle Heights Drive intersection. Alternatively, cyclists can park their bikes at Raymer’s Cove and walk approximately 750 feet west along the Lakeshore Path to reach Wally Bauman Woods. Hikers can reach Wally Bauman Woods along the Lakeshore Path approaching from the east. The Lakeshore Path terminates at the western edge of Wally Bauman Woods. Please do not walk beyond the gate onto the adjacent private property. 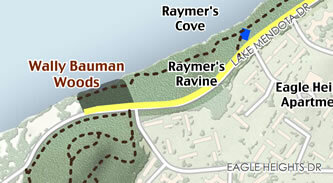 You may park in the short-term lot at Raymer’s Cove (blue square in map image above) and access the Woods along the Lakeshore Path. Please do not park in the permit-only lots at Eagle Heights Apartments. Parking is not permitted on Lake Mendota Drive.